Zhuge Liang holding his trademark feather fan. Read more about the Chinese name. This is a Chinese name; the family name is Zhuge (諸葛). Zhuge Liang or Chu-ko Liang or Zhuge Kong Ming (born 181 C.E., Yangdu, Shandong province, China—died August 234, Wuzhangyuan, Shaanxi province, China) was one of the greatest Chinese strategists of the Three Kingdoms period, as well as a statesman, engineer, scholar, and inventor. He was nicknamed "The Hidden Dragon," because people around him underestimated his abilities. According to legend, the military warlord Liu Bei, came three times to visit Zhuge Liang in his wilderness retreat before he agreed to become his advisor. Zhuge helped Liu Bei to organize his forces and establish the Shu-Han (蜀漢) dynasty of the Six Dynasties period. On his deathbed, Liu Bei urged Zhuge to take the throne himself if his own son, Liu Shan, proved incapable of ruling, but Zhuge served the son as faithfully as he had served the father. During his reign as regent, Zhuge Liang pursued the goal of restoring the Han Dynasty, which had been usurped by Cao Wei. Four of his five Northern Campaigns failed due to a shortage of supplies, and Zhuge died before achieving his goal. Zhuge Liang is considered the most popular Chinese hero and statesman, and most people learn of his achievements through the many stories and plays written about him. 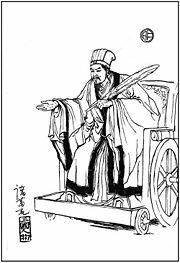 Supernatural powers were ascribed to him, and he is credited with a number of inventions, including mantou (steamed rice buns), the land mine, a mechanical transport for grain, and the Zhuge-nu, a crossbow that shoots multiple arrows. In the fourteenth-century historical novel San Kuo chih yen-i (Romance of the Three Kingdoms), Zhuge was portrayed as the embodiment of intelligence and ingenuity, and was given power over the winds. Several books are popularly attributed to him, inclduing the Thirty-Six Strategies, and Zhuge Liang's The Art of War (not to be confused with Sun Tzu's The Art of War). Zhuge Liang was born 181 C.E. in Yangdu County (陽都) in Langya Commandery (琅琊), at present-day Yinan County (沂南), Shandong Province. He was the second of three brothers and was orphaned early; his mother died when he was nine, and his father when he was twelve. He and his siblings were raised by his uncle. When Cao Cao invaded Shandong in 195, his family was forced to flee south, and his uncle soon died of illness. Although both his sisters married into important families with numerous connections in the area, for ten years he resided as a recluse in Longzhong Commandery (隆中; in present-day Hubei province) with his brothers Zhuge Jin (who later served the Wu Kingdom) and Zhuge Jun (諸葛均) living the life of a simple peasant, farming by day and studying by night. He made friends among the intellectuals of the area, and his reputation soon grew; he was named the Crouching (or Sleeping) Dragon, wiser than his peers in many areas. He married the daughter of another renowned scholar Huang Chengyan, whose wife was the sister of Lady Cai, wife of the warlord Liu Biao, and Cai Mao, one of Liu Biao's most powerful generals. His wife's name was said to be Huang Yueying; Huang family was also connected to several other well established clans in the region. Zhuge is an uncommon two-character compound family name. The warlord Liu Bei (or Liu Pei), ruler of the Kingdom of Shu, was harboring in the neighboring city Xiangyang under his distant relative and the governor of the Jing Province (荊州), Liu Biao. Zhuge Liang joined Liu Bei in 207, after Liu visited him in person three times to coax him out of seclusion. Zhuge Liang suggested his Longzhong Plan (隆中對), a strategic alliance with the Wu Kingdom against Cao Cao in the north, who had the strongest force. After presenting his famous Longzhong Plan before Liu, Zhuge traveled in person to Eastern Wu (東吳)and formed an alliance with its ruler Sun Quan (孫權). In the Battle of Red Cliffs (赤壁之戰otherwise known as Chibi) of 208, the allied armies of Liu Bei and Sun Quan defeated Cao Cao, enabling Liu Bei to establish his own territories. The novel Romance of the Three Kingdoms (三國演義) related that Zhuge Liang called forth a southeastern wind to sweep the Wu officer Huang Gai's fire-attack throughout Cao Cao's ships. In reality, however, it was the Wu general Zhou Yu who masterminded the fire attack. In folklore, the wind is attributed to either Zhuge Liang's magic or his ability to predict the weather. The union with Sun Quan broke down when Wu general Lü Meng invaded the Jing Province in 219 while its defender Guan Yu was at the Battle of Fancheng (樊城之戰). 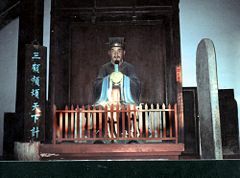 Guan Yu was eventually captured by the Wu forces and was decapitated. Liu Bei, infuriated with the execution of his longtime comrade, ignored all the arguments of his well-meaning subjects and turned on Eastern Wu, leading a huge army to seek revenge. He was defeated in the ensuing Battle of Yiling (猇亭之戰) by Lu Xun, and died in the lone fortress of Baidicheng after a hasty and humiliating retreat to his own borders. After the death of Liu Bei, Zhuge Liang became the chancellor of Shu Han( 蜀漢) under Liu Bei's son Liu Shan, the second and last emperor of the Kingdom of Shu, and renewed the alliance with Sun Quan. Despite Liu Bei's request that Zhuge assume control of Shu Han should his son prove to be an incompetent leader, Zhuge did not, serving Liu Shan unwaveringly. During his reign as regent, Zhuge Liang pursued the goal of restoring the Han Dynasty, which, from Shu's point of view, had been usurped by Cao Wei (the Kingdom of Wei , 曹魏). Zhuge Liang felt that in order to attack Wei he would first have to unify Shu completely. If he fought in the north while the Nanman (南蠻, "southern barbarian") people rebelled in the south, then the Nanman people would advance further and perhaps even press into areas surrounding the capital. So rather than embarking on a Northern Expedition, Zhuge Liang first led an army to pacify the south. .
Ma Su, brother of Ma Liang (馬良, 季常) and a Shu strategist, proposed that Zhuge Liang should work toward getting the rebels to join him rather than trying to subdue all of them, and he adopted this plan. Zhuge Liang defeated the rebel leader, Meng Huo, seven different times, but released him each time in order to achieve his genuine surrender. Finally, Meng Huo agreed to join Zhuge Liang in a genuine acquiescence, and Zhuge Liang appointed Meng Huo governor of the region, so he could govern it as he already had, keeping the populace content, and keeping the southern Shu border secure to allow for the future Northern Expeditions. Zhuge Liang also obtained resources from the south, and after this, Zhuge Liang made his moves north. From 228 until his death in 234, Zhuge Liang launched five Northern Expeditions against Cao Wei, but all except one failed, usually because his food supplies ran out rather than because of failure on the battlefield. His only permanent gain was the annexation of the Wudu (武都) and Yinping (陰平) prefectures as well as the relocation of Wei citizens to Shu on occasion. During his first Northern Expedition, Zhuge Liang persuaded Jiang Wei, one of Cao Wei’s generals, to defect to Shu Han. Jiang became one of the prominent Shu generals, and inherited Zhuge Liang's ideals. On the fifth expedition, Zhuge died of overwork and illness in an army camp in the Battle of Wuzhang Plains, at the age of 54. At Zhuge's recommendation, Liu Shan commissioned Jiang Wan to succeed him as regent. In the novel Romance of the Three Kingdoms, Zhuge Liang attempted to extend his lifespan by twelve years, but failed when the ceremony was disturbed near the end by Wei Yan rushing in to announce the arrival of the Wei army. The novel also related that Zhuge Liang passed "The 24 Volumes on Military Strategy" (兵法二十四篇) to Jiang Wei on the eve of his death. Before the Battle of Red Cliff, Zhuge Liang went to visit the Wu camp to assist Zhou Yu (周瑜), a famous militarist and strategist of Eastern Wu. Zhou Yu, who saw Zhuge Liang as a threat to Wu, assigned Zhuge Liang the task of making 100,000 arrows in ten days or facing execution. Zhuge Liang, however, swore he would finish this seemingly impossible task in three days. He requested 20 large boats, each manned with many straw men and a few soldiers. Before dawn, Zhuge Liang ordered his soldiers beat war drums and shout orders, to imitate the noise of an attack on the Wei army. Zhuge sat inside one of the boats with Lu Su, a Wu advisor, drinking wine. The Wei soldiers, unable to see in the dark, fired many volleys of arrows at the sound of the drums. The straw men were soon filled with arrows, and Zhuge Liang returned to Wu having fulfilled his promise. In Chapter 84, as Lu Xun, a general of Eastern Wu, pursued the fleeing Liu Bei after the Battle of Yiling, he felt a strong enemy presence near Baidecheng and cautioned his army for possible ambush. He sent scouts ahead, who reported that the area was empty except for some scattered piles of stones. Bewildered, he asked one of the locals, who answered that qi (spiritual energy) started to emerge from the area after Zhuge Liang had arranged the stones there. Lu himself then inspected the area, and determined that the array was only a petty display of deception. He led a few cavaliers into the array, and as he was about to come out, a strong gust of wind blew. Soon, dust storms were obscured the sky and the stones became swords, and mountainous piles of dirt emerged, while the waves of the Yangtze sounded like swords and drums. Lu exclaimed, "I fell into Zhuge's trap!" and attempted to exit, to no avail." Suddenly, Lu saw an old man standing before his horse, who then asked if Lu Xun needed assistance out of the array. Lu followed the man and exited the maze unharmed. The old man revealed himself to be Zhuge Liang's father-in-law Huang Chengyan, and explained that the array was constructed using the ideas of the bagua . Huang said that as Zhuge Liang was constructing the maze, he had predicted that a Wu general would stumble across it, and asked Huang not to lead the general out when that happened. Lu immediately dismounted from his horse and thanked Huang, and when he returned to his camp, he exclaimed that he could never top the genius of Zhuge Liang. During the first Northern Expedition, his efforts to capture Chang'an were undermined by the loss of Jieting, a passageway into Hanzhong. With the loss of Jieting, Zhuge Liang's current location, Xicheng (西城), was in great danger. Having sent out all the troops except a handful of civil officials, Zhuge Liang decided to use a ploy to ward off the advancing Wei army. Zhuge Liang ordered all the gates of Xicheng to be opened and had civilians sweeping the roads while he sat high up on the gates, calmly playing his zither with two children beside him. When the Wei commander and strategist Sima Yi approached the fort with the Wei army, he was puzzled by the scene and ordered his troops to retreat. Zhuge Liang later told the bewildered civil officials that the strategy only worked because Sima Yi was a suspicious man, having personally witnessed the success of Zhuge Liang's highly effective ambushes and deceptive tactics many times before. Furthermore, Zhuge Liang had a reputation as a keen but extremely careful military tactician who rarely took risks. Zhuge's well-known carefulness, coupled with Sima Yi's own suspicious nature, led Sima Yi to the conclusion that entry into the apparently empty city would have drawn his troops into an ambush. It is unlikely the same strategy would have worked on someone else, and indeed Sima Yi's son Sima Zhao had seen through the ruse immediately and counseled his father against retreat. Zhuge Liang's name is synonymous with wisdom in Chinese. 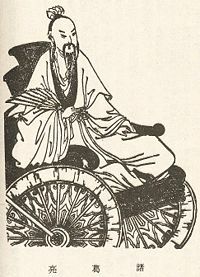 He was believed to be the inventor of the ''mantou'' (a steamed bun eaten as a staple in many parts of China), the landmine and a mysterious, efficient mechanical transportation device (initially used for grain) described as a "wooden ox and flowing horse" (木牛流馬), which is sometimes identified with the wheelbarrow. 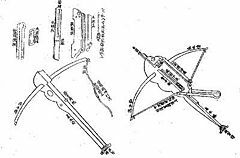 Although he is often credited with the invention of the repeating crossbow which is called Zhuge Nu (Zhuge Crossbow), this type of semi-automatic crossbow is actually an improved version of a model that first appeared during the Warring States Period (though there is debate as to whether the original warring states bow was semi-automatic, or instead shot multiple bolts at once). Nevertheless, Zhuge's version could shoot further and faster. He is also credited with constructing the mysterious Stone Sentinel Maze, an array of stone piles that is said to produce supernatural phenomenon, located near Baidicheng. An early type of hot air balloon used for military signaling, called the Kongming lantern, is also named after him. In 1724, he was made a Confucian saint. Some books popularly attributed to Zhuge Liang can be found today, such as the Thirty-Six Strategies, and Zhuge Liang's The Art of War (not to be confused with Sun Tzu's The Art of War). His mastery of infantry and cavalry formation tactics based upon the Taoist I-Ching was said to be unrivalled. His Chu Shi Biao, written before the Northern Expeditions, was considered so moving that it was said that the person who read it and shed no tears would be a disloyal person. The Temple of the Marquis of Wu in Chengdu, a temple worshipping Zhuge Liang. Where to seek the temple of the noble Premier? And among the leaves orioles empty songs sing. Two dynasties he served with one heart. Tears damp the robes of heroes ever since. Bai Chongxi, a military leader of the Republic of China and warlord from Guangxi province, earned the laudatory nickname "Little Zhuge" due to his tactical decisions in the Second Sino-Japanese War during the World War II. Takenaka Shigeharu, a Sengoku Period samurai who served under the early Toyotomi Hideyoshi, was himself often likened to Zhuge Liang due to his reputation as an exceptional strategist, and due to a fictional account of Hideyoshi recruiting Shigeharu by visiting him three times, in a manner similar to the Three Visits paid to Zhuge by Liu Bei. Chen, Shou. c. 280. Sanguo zhi (History of the Three Kingdoms). Beijing: Zhonghua shuju, 1959. This page was last modified on 3 July 2013, at 14:07.